Yesterday, I wrote all about my love for the King Arthur Flour Company (KAF). If you missed the post, it's worth going back and checking it out. Go on. This post will still be here when you're done. Now... on to the giveaway! 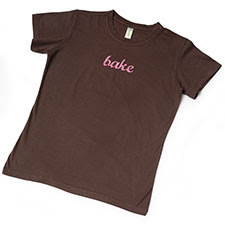 About a month ago I received an email from KAF touting a cute new T-shirt that says "bake" across the front. As a baker, I was immediately smitten and thought that those of you who read my blog and bake a lot would love the T-shirt too. With crossed fingers and high hopes, I sent off an email asking if we could work together on a giveaway. KAF's Web media coordinator replied that she would love to work with me on a giveaway, and in addition to the T-shirt, she would also like to throw in a bag of all-purpose flour and a recent copy of The Baking Sheet. Did I mention I love the King Arthur Flour Company?! One of you is getting so spoiled! The shirt also comes in pink with brown letters, green with cream letters, a men's version, and a kid's version. And I can tell you from personal experience that it's incredibly soft and comfortable. In order to be eligible for the giveaway, please leave a comment letting me know something about the King Arthur Flour Company that you already love or something you are now inspired to check out after reading my post yesterday. If you have some time, head over to the King Arthur Flour Company Web site, and tell me about all the products you would get or the classes you would take -- let's pretend money's no object here. 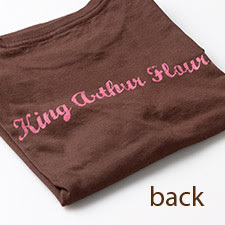 Note: King Arthur only ships to U.S. addresses. You have until 11:59 p.m. EST on Tuesday, July 6, 2010 to leave your comment. One comment per person please. Thank you so much to the King Arthur Flour Company for providing me with the opportunity to host such a great giveaway! Fact: I love the King Arthur Flour Company. There are so many reasons I am enamoured with the King Arthur Flour Company that it's difficult to decide where to begin, so I guess I'll begin with the obvious: the flour. As someone who bakes all the time -- and I mean ALL the time -- having high-quality flour is a must. Ever since I started using King Arthur flour, I haven't used anything else. With King Arthur flour I make what I deem to be the tastiest, highest-quality baked goods and treats I possibly can, and that's really important to me. We even use King Arthur flour at the bakery where I work. Why is King Arthur flour so great? I know King Arthur Flour tends to be a little pricier than other flours, so why should you splurge? What is there besides flour? Besides the various flours, from white to whole wheat to bread (there are even gluten-free flours and nut flours), the King Arthur Flour Company offers tons of other products. I find out about them all the time from the catalog I get in the mail, the emails I get from King Arthur, and the browsing I do on their site. And not only are there tons of great products to choose from, but online shopping and checkout are simple, and delivery is speedy! Maybe that's why I place orders on their site so often. And what is there to do when you're done shopping? 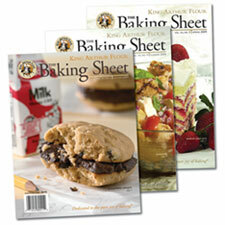 On top of all the wonderful products, the King Arthur Flour Company has so many other resources for bakers. This is King Arthur Flour's award-winning, bimonthly, 24-page newsletter, which includes great tips, techniques, and recipes. This is the company blog. You can read about the different bakers' experiences at King Arthur, recipes they've made, trials and tribulations in the kitchen, new uses for old bakeware and ingredients, and so much more. King Arthur has an amazing Baking Education Center. I say that based on reputation; I haven't taken any of the classes myself... yet. There are introductory classes and more intensive week-long courses. There are classes for children and classes with guest bakers. 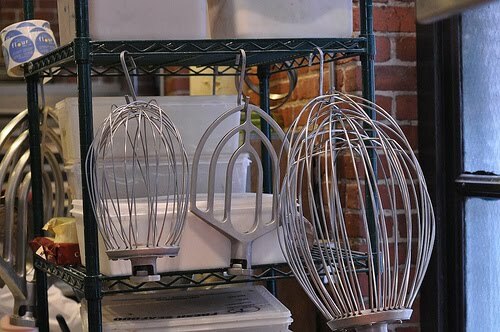 There are also traveling baking demos for those who don't live near the center in Vermont. I would definitely love to take a bread class and a cake decorating class. Speaking of... I keep thinking of trying to get a group of Boston bloggers/bakers together to trek up there for a class. Any interest? There are so many recipes on the site to choose from. I've made the oatmeal bread and the chocolate stout cake and, most recently, some cinnamon bread (upcoming post alert). Not to mention that the company itself sounds incredible. And it's 100 percent employee-owned! Check out this great video of a day at the King Arthur Flour Company. (Although if you watch it, you might realize what a baking nerd I am. What can I say? It inspires me.) I know that if I lived in Vermont, I would definitely try to work there. If you have to have a job, wouldn't you want to work somewhere that requires you to take free baking classes? Enough said. So I told you a giveaway was coming up... and not just any giveaway... a giveaway that is near and dear to my baking heart. I love King Arthur so much that I actually approached them about doing a giveaway... because I love you all too! So come back tomorrow for your chance to win some great stuff from the King Arthur Flour Company! What are your favorite baking products/companies? Flour Bakery + Cafe, Cambridge, Mass. 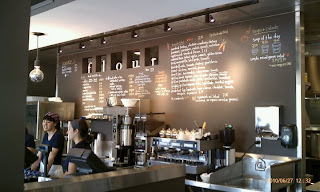 I just got home from Flour Bakery + Cafe in Cambridge, the third location of Joanne Chang's fabulous Flour Bakery. The Cambridge location officially opened this past Friday, but today we had a soft opening for employees and their guests. Perhaps this is the right moment to disclose that I am a Flour employee. I have been working at Flour for almost a year now. I started at the South End location on Washington Street working the cookie shift last July. I baked cookies, shaped croissants, scooped muffins, and helped wherever I was needed on Mondays, Tuesdays, and Saturdays while holding down my editing job in the evening and the other days of the week (which I still do now but in a much smaller capacity). In February I was offered the opportunity to work full time at Flour's second location in Fort Point Channel on Farnsworth Street. I went from baking cookies to making and baking everything we sell there. My official title is pastry cook, and my shift is called the case shift. Being on the case entails finishing and setting out all of the cakes, tarts (and little tartlets like the ones below), and other products that go in our front cold display case, as well as filling cake orders. Once I finish executing my case responsibilities for the day, I move on to production. This is when all the rest of the mising, mixing, panning, baking, depanning, and displaying activities occur. I get to work with a mixer that has a bowl so big I can sit in it. I use ovens that can bake 18 coffee cakes at a time. And the thing that will probably excite Flour fans most, I make our famous sticky buns and other brioche products practically every week, trading off this responsibility with other bakers. I loved working at the South End location and love my current position at Fort Point too, but I am also beyond excited to be involved with the opening of the Cambridge location. I'll be flitting back and forth between Cambridge and Fort Point for a bit but will ultimately end up working at the Cambridge location, which is closest to where I live and in what I consider my extended neighborhood. Hope you'll stop by if you live in or are visiting the area! If you're not local and you want to try some Flour goodies, check out the cookbook: Flour: A Baker's Collection of Spectacular Recipes. Today's farmers' market theme was green and gold -- and not on purpose. I just wandered around as usual grabbing some of this and some of that. I was really drawn to squash this week and bought a couple unusual ones. Okay, so these are pretty normal. I also selected some broccoli to have as a side with one of our dinners this week and some cucumbers and carrots to add to a salad. I was told these are more mild than the orange variety. I'll let you know! I was disappointed that I couldn't really find any tomatoes at any of the stands, and I didn't move fast enough to grab one of the two remaining containers of cherry tomatoes at Kimball's stand. The woman there told me they would have tomatoes starting the third week of July and would continue to have cherry tomatoes each week. That's good news for me because I'm actually working the next two Saturdays and can't go to the farmers' market, but when I can finally go again, there will be tomatoes! I also picked up a little cheese! Have you heard of Fiore Di Nonno? I didn't know much about them until they "friended" me on Facebook last week. Since then, I've been reading mouthwatering status updates about their mozzarella and burrata. They make their mozzarella fresh daily. I knew I had to stop by their booth at the farmers' market this morning. I sampled some of their mozzarella -- it tasted so fresh and salty! And then I bought some roasted garlic and onion burrata to try this week. They also have a fig jam burrata and a za'atar burrata. I might have to try a different kind next time! What did you get at the farmer's market this week? What would you make with these farmers' market finds? Have a great day! Now, I've got to go make us some breakfast -- or I guess at this point I should say brunch! Well, I think I've made it through all of my farmers' market purchases from Saturday! Some of the strawberries and the basil were turned into strawberry shortcake sammies and sugared basil leaves. I talk about these sugared basil leaves so much, you must think I'm obsessed, and I won't deny that I am. I've actually been working on the recipe and have finally come up with a crisp version that's more like what I had at Bergamot. It definitely impressed my family and extended family who tried the basil at my sister's graduation party this past weekend. I'll share the new recipe with you soon! The rest of the strawberries and the mint made for sweet, summery strawberry mojitos when mixed with some rum, simple syrup, and club soda. I would share this recipe if I used one, but I honestly just muddled strawberries and mint, added some simple syrup, added some rum, added some club soda, added a little more rum, added a little more club soda -- well, you get it! And those beautiful beets... I roasted them, paired them with compatible ingredients, and created a tantalizing salad with earthy, seasonal flavors. I know that beets aren't favored by everyone, but even if you know you don't like traditional red beets, you should give these golden and Chioggia beets a try. They're much sweeter. And cutting them open, especially the Chioggia beets, reveals beautiful rings, which might even entice someone who's "anti-beet." This elegant, farm fresh salad calls for several steps but isn't all that complicated. Below I've given you the steps to follow to have all the components ready at relatively the same time. Depending on how large your beets are, you may have to roast them longer and could end up waiting on them a little -- this is the perfect time to pour yourself a glass of wine, kick back on the couch, or catch up on blog reading (something I really need to do). Start by roasting the beets, as this is the most time-consuming step. Preheat the oven to 375 degrees. Cut the tops and bottoms off all of the beets, and scrub them gently under running water. Set out two pieces of foil -- each large enough to hold one type of beet -- on a sheet pan. Place the Chioggia beets on one piece of foil, and place the golden beets on the other. Drizzle all of the beets with the sunflower or canola oil and sprinkle them with salt and pepper. Close up the foil packets and transfer the beets to the oven. Roast for 30 minutes or until you can push the tip of a knife through the beets with ease. Set aside to cool enough to handle. While the beets are roasting, set out two more pieces of foil on another sheet pan. Place the pine nuts on one piece of foil and the walnuts on the other. Tuck these in the oven on the rack below the beets to toast. The pine nuts will likely be done after 10 minutes and the walnuts after 15 or 20 minutes. 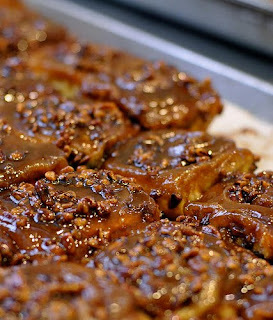 You can lift the pine nuts, foil and all, right off the sheet pan and put them on a rack to cool. Leave the walnuts in until they are well toasted, and then transfer them to a rack to cool too. While toasting and roasting, make your salad dressing. Whisk the mustard, champagne vinegar, and lemon juice together in a small bowl. Slowly whisk in the walnut oil, and then season to taste with salt and pepper. (I like to dip a leaf of whatever green I'm having into the dressing to test the flavor. It's much more effective than just dipping your finger in and tasting the dressing on its own.) Set the dressing aside. Place the log of goat cheese on the counter, so it will come to room temperature or close by the time you use it. By now your beets are cool enough to handle, or you're playing the waiting game. When your beets are cool enough to handle, rub them with paper towels to remove the skin (a trick I learned from Ad Hoc at Home -- it keeps your hands cleaner and simplifies the whole process). Cut the beets in quarters or dice them depending on how big they are and what size chunks you want in your salad. Assemble your salad. Place a handful of Mache on a large dinner plate. Drizzle with dressing, and toss until the rosettes are evenly coated. Top with some of the roasted beets. Sprinkle some toasted walnuts, toasted pine nuts, and cherries on top. Lastly, decorate the salad with some dollops of goat cheese, and drizzle with more dressing, if desired. Feel free to substitute a different dressing, your favorite kind of nut, or whatever dried fruit you think will perk up the salad. You can also use lettuce instead of the Mache (a European salad green). I just love the look of the green rosettes and the nutty flavor they add. And if you're not a lover of goat cheese, you could try Parmesan or ricotta salata instead. Do you like beets? What would you make with some bunches of beets? 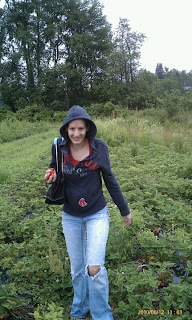 Last Saturday we went strawberry picking... in the rain. Now, having done it both ways, I will tell you, it is much more enjoyable to go on a hot July day when the sun beats on the strawberries, causing them to release all their fragrance into the air. Getting a little tan and soaking up some Vitamin D while gathering as many of the juicy fruits as you can into a cardboard basket is pleasant, even therapeutic. On the other hand, getting soaked through with a chilly rain and fearing putting the basket on the ground because the bottom might get soggy, fall out, and cause you to lose all those just-picked strawberries is not quite so pleasant. But I only have Saturdays off, and I wasn't about to let a little rain ruin my plans. So Jeff and I took a leisurely drive to Kimball Fruit Farm up in Pepperell, Mass., early Saturday morning, thinking we might actually miss the rain. I googled a few different farms but went with Kimball because it has a stand at my local farmers' market in Union Square, and I'm always impressed with the wares. Of course, I could have just gotten some strawberries at the farmers' market that very morning instead of trekking to Pepperell and sloshing around in the strawberry patch, but there's no adventure in that! We got off to a slow start. 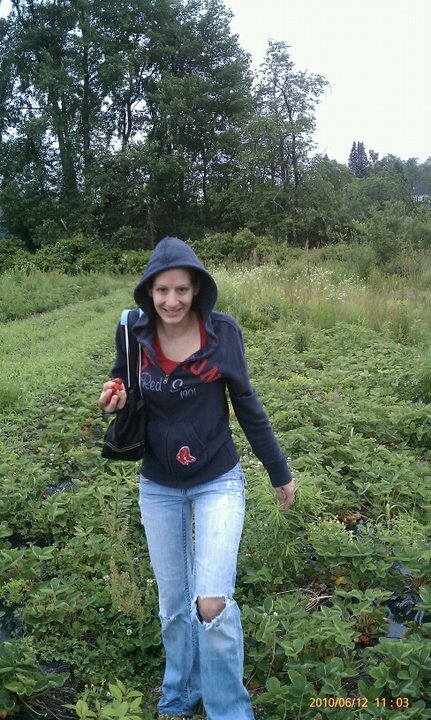 We were basically sent out back to the strawberry patch with no sense of direction whatsoever. In Connecticut, where I grew up, we would go strawberry picking, and it was all very organized. People would direct you to the rows that were ripe, ready for picking, and not already picked over. It was incredibly systematic, and I sort of expected that everywhere. To me it makes sense to keep track of what has been picked and what hasn't. But here, we were on our own, so we wandered aimlessly for a bit, checking here and there for that telltale red of a ripe strawberry. We finally settled into picking and surprisingly ended up with about 3 pounds of strawberries. I picked up a few veggies before we left the farm, and then we decided to make a quick stop at Parlee Farms in Tyngsboro, Mass., to see whether we had chosen the better place to go picking. We never made it far enough to check out the strawberry patch because as soon as we walked into the little farm store, the overwhelming scent of something fried and strawberry caught our attention. With a quick scan of the store, we found the source of that enticing smell: a donut maker! We bought a little bag of hot, fresh mini strawberry doughnuts for the car ride home. Back at home, I had a plan for those just-picked strawberries. A whole pound of them was to be used to make fresh strawberry ice cream. You may remember that I made strawberry ice cream a while ago. Well, I loved that recipe so much that I used the same one again. It's just heavy cream, strawberries, sugar, lemon juice, and salt. It could qualify for one of those new Haagen Dazs five flavors. And this time, Jeff made the ice cream because I was too busy preparing dinner, which included fresh tomato sauce from tomatoes we picked up at the farm. The diminutive profiteroles captured fresh strawberry flavor; light, airy pate a choux; and smooth, rich chocolate sauce all in one bite. They'd make a wonderful summer party dessert! Preheat oven to 425 degrees. Line two cookie sheets with Silpats (or butter the cookies sheets). Bring butter, water, and salt to a boil in a small saucepan, stirring until butter is melted. Reduce heat to medium, and stir in all of the flour. I like to use a wooden spoon for this. Continue stirring until mixture forms a ball and pulls away from the sides of the pan, about 30 seconds. Transfer mixture to bowl of electric mixer, and let cool for 2 to 3 minutes. Using electric mixer fitted with paddle attachment, beat the eggs into the dough one at a time. Transfer mixture to a piping bag fitted with a small round tip. Pipe mounds of dough about 3/4 inch in diameter onto a cookie sheet 1 inch apart. Pat down any peaks with your fingertip. Melt sugar in small, heavy saucepan over medium heat, stirring occasionally and swirling pan to make sure it melts evenly. When the sugar reaches a dark amber color, remove the pan from the heat. Carefully stir in the cream and a pinch of salt. Return to heat, and continue stirring until caramel dissolves. Remove from heat, and whisk in chocolate and vanilla. Cover, and keep warm. Make sure your profiteroles are completely cool, and remove your ice cream from the freezer, allowing it to soften enough to scoop it. Place three or four profiteroles on a dessert plate. Cut them in half horizontally. And then, using a small scoop, place a scoop of ice cream on each profiterole base. Replace the tops. Drizzle with chocolate, and serve. Repeat for as many servings as you need, or until you run out of profiteroles. Any leftover chocolate sauce and ice cream pair up very well for ice cream sundaes! Have you been picking or buying strawberries? What are you making with them? For another idea check out my Mini Strawberry Shortcake Sammies With Sugared Basil Leaves. They're so simple. I actually made them again this weekend for my sister's high school graduation party. And... Happy Father's Day to all the dads out there! Since my sister's graduation party happens to be today, I'm lucky to be home in CT spending the day with my dad... and the rest of my family.